How can I tell if a disk is failing on ESXi / what do these errors mean? I have a server running VMware ESXi v4.1.0 348481. It has a hardware RAID10 and a SATA backup drive. I have a VM running which has it's primary boot vmdk on the RAID10 datastore, and a 600 GB vmdk on the SATA backup drive's datastore. The VM runs Debian linux with the FreeBSD kernel, and uses ZFS for the backup drive. I tried to reboot the VM and I received a message that the system was going down for reboot, and then that hung. (^C appears but does not kill shutdown). 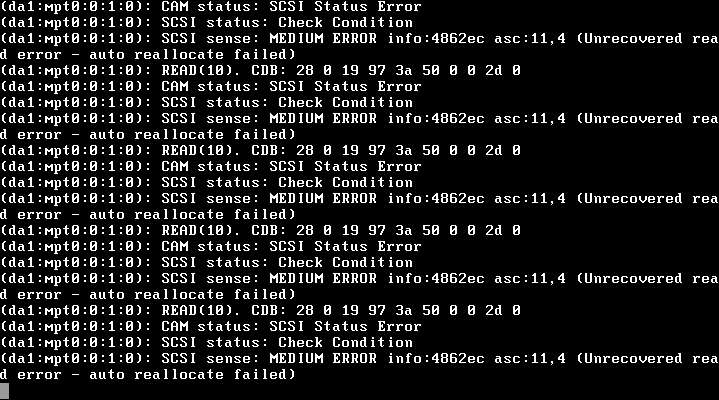 I cannot interrupt or kill -9 the zpool list zfs list or rsync processes -- Nothing happens when I try. Does this ndicate the backup SATA drive is failing? Or could this just be an ESXi error? How in the vSphere client could I tell if the drive is failing? I didn't see any indication, everything under Hardware Health Status looks good, and I saw nothing under the Storage config. How should I proceed from here? Should I just hard reboot the VM? Those errors do indeed indicate one of the SATA drives has encountered enough bad blocks to run out of block-reallocation space. That drive is bad, and needs to be replaced. I'm not sure where in the vSphere client that information is displayed, but the log entries are pretty clear. If your hardware allows it, a hot-swap should be doable. Otherwise, you're going to have to shut everything down to perform the change-out. If that VM hasn't shut itself down after 30 minutes, it's time to just hard-terminate it. It's risky, but if it is truly hung there isn't much for it. Not the answer you're looking for? Browse other questions tagged vmware-esxi drive-failure debian or ask your own question. How can we remotely monitor VMware ESXI? How to delete old linux partition with ESXI? ZFS keeps repairing the same disk when scrubbing - what does that mean?